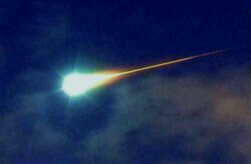 "Typically, about 10 to 15 meteors or meteorites are visible per hour," said Renner. "However, this year, we have a 'new' moon, which means dark skies and conditions favorable for seeing more meteors. Incidentally, the peak of the Lyrid shower is actually Saturday evening/early Sunday morning. That's when I plan to look for some." io9 has a great guide for how to catch the meteor shower and there the Meteor Counter App from NASA for those of you who want to be citizen scientists and help count meteors. If you want to talk about the planets before it gets dark, my favorite computer apps are Stellarium, Microsoft Worldwide Telescope and Google Sky - all free. This is a perfect example of how schools just cannot complete your child's education. Grab your children and grandchildren, find a place to view, bring out the hot chocolate and enjoy the meteor shower.